According to Gladstone resident Deborah Herman, 55, the process of bringing her daughter to Excellent Physical Therapy for a recent soccer-induced knee injury prompted her to think about her own chronic knee, hip, and back pain. 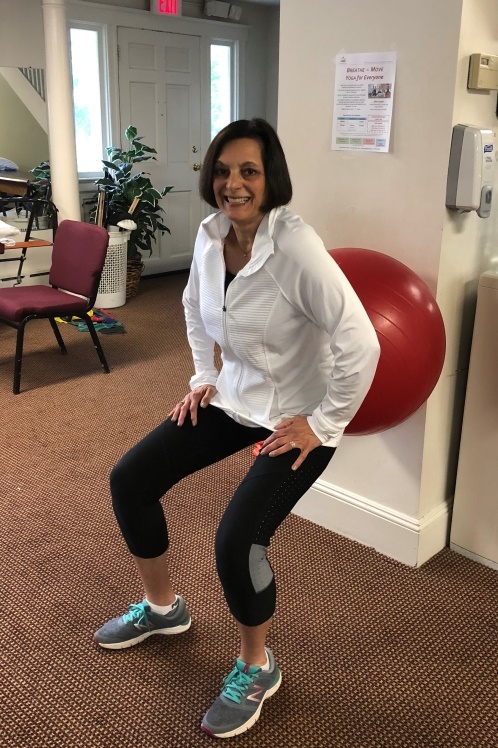 While she'd always been physically active, "I'd increased my amount of exercise over the past year and, while I was getting stronger, I was experiencing more pain too," said Deborah, who attributed the pain in her hips and knees to the aging process. Despite the range of advice she received from different practitioners and her own pursuit of other types of exercise in an effort to address her pain, "nothing worked and everything I was doing was actually making it worse," she said. That is, until she began working with the team at Excellent Physical Therapy this past September. After a thorough evaluation, "Lou DiGiovine diagnosed me with ‘patellofemoral pain syndrome' (PFPS), also known as ‘runner's knee,' which was causing friction and a dull pain in the front of my knees and radiating to my hips, thighs, back, etc.," Deborah said. Since then, "Lou, Frank LaMorte (DPT), and Staci Wojcik (DPT) have all helped work out my muscles manually, apply appropriate heat, ice, and electrical stimulation, and oversee targeted leg and knee exercises specially designed to strengthen muscles around my knees that are weak. They really got me going in the right direction and I don't have chronic pain in my knees anymore," shared Deborah, who looks forward to resuming cardio activity and workouts on the elliptical machine soon. 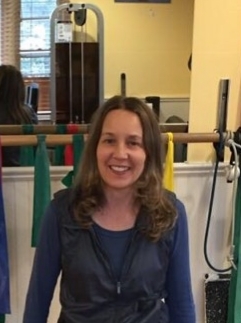 "The team at Excellent Physical Therapy is so helpful, friendly, attentive to detail, and open to sharing information and answering any question you might have," said Deborah, who works out at EPT twice a week. "They sincerely care about your wellness and have helped me tweak my workouts so that I can do more and more safely. They've also made me custom orthotics to combat the pronation of my feet, which will further support my proper alignment," she said. While she acknowledged that it can often be hard for people to evaluate between different providers, Deborah confirmed that a visit to Excellent Physical Therapy is an investment well made. 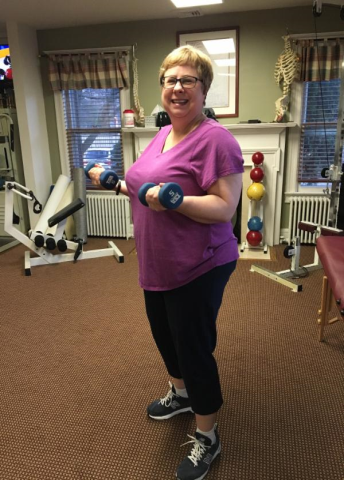 "If you have pain, you shouldn't necessarily assume that your body is breaking down due to age," concluded Deborah, who's happy that her routine now includes exercises for core stability, posture, and balance. "The team at EPT is very knowledgeable and collaborative," she said, "and you'll get a lot of high-quality guidance and support for your session." Currently back at EPT to address lower back issues associated with the shoulder injury, “I’ve seen a big difference and definite improvement so far,” she said of the stretching and strengthening exercises and hands-on work she’s undergone. Looking forward to working yoga classes into her schedule soon, Hengemuhle is grateful for the support EPT continues to provide. “The team at Excellent Physical Therapy offers high quality treatment and they’re truly like family,” she said. Two years ago, Chester resident Jake Stagman was an up-and-coming college pitcher with Major League dreams when he tore the ulnar collateral ligament in his right elbow while pitching in a summer league in Florida. Facing a potentially career-ending injury, he opted for special reconstructive surgery to repair the ligament (a procedure often known as ‘Tommy John surgery’ in honor of the renowned 1970s Yankees pitcher who helped make the procedure famous) and restore his career. But all didn’t go as planned. “I had the procedure in August 2016 and was committed to Marist College in New York, a Division 1 school, but I didn’t get the proper surgery/rehab treatment and needed a second surgery,” the now 20-year-old shared of his ordeal. Following the second surgery he underwent in August 2017, Jake was recommended to go to Excellent Physical Therapy by a friend and started up with them last summer. 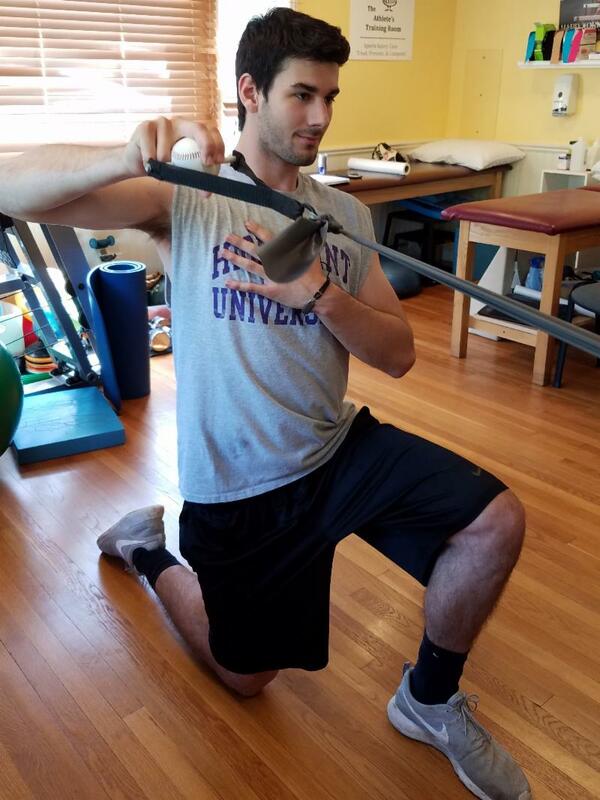 “They were very conveniently located to me and I started working with Lou and his team on range-of-motion and strengthening exercises, then on building muscle groups around the elbow and shoulder, and finally on a throwing program to help me get back to my sport,” said Jake, who went to EPT three times a week for the first 5-6 months and will continue training there 1-2 times a week through the summer. “The Major Leagues have always been a dream of mine, but for right now I just hope to play for a great college team again,” he said. 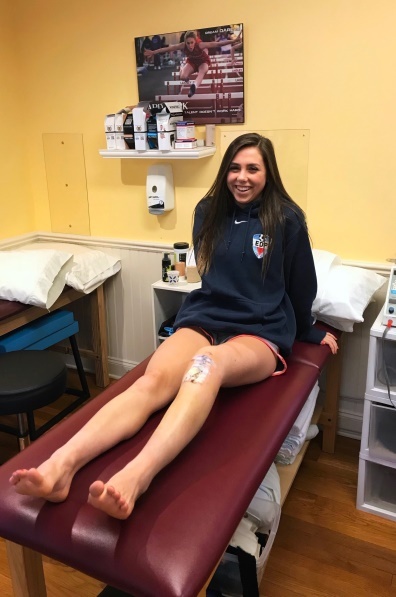 A junior at Bernards High School in Bernardsville, Caroline was a star soccer player and swimmer who was being considered for recruitment by several Division I colleges – until an unexpected injury threatened to derail her bright future. “In September 2017, I tore my ACL during a soccer game,” shared the 17-year-old, whose teammates helped her off the field that fateful day. “I was on crutches for three weeks and couldn’t run, jump, or pivot all winter.” Facing impending surgery and the prospect of being sidelined for months, “I was really sad,” she said. 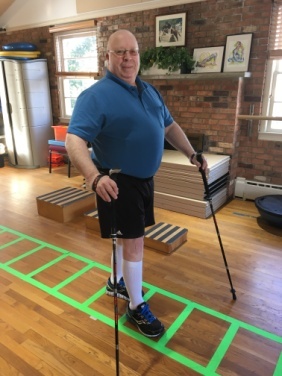 Ken’s pursuit to stay safely active also led to his development of the ‘Velochair,’ a personal mobility device ideal for anyone who’s challenged to be on their legs, including individuals dealing with spinal stenosis, Parkinson’s disease, MS, peripheral artery disease (PAD), stroke, and many other conditions. “The Velochair only requires one active leg and one active arm to operate and has allowed me to stay active and fully participate in life safely,” shared Ken, who recently secured a patent on his unique mobility device and will soon begin commercial sales. As a busy psychologist who supervises nurses and counselors for a school district and also runs a private practice, Bedminster resident Debbie Dawson has little room in her schedule to be sidelined by injury. Five years ago, however, she endured a dislocated patella (likely an exacerbation of sports-related injuries for which she had open knee surgeries decades ago). Then, in 2016, she experienced loss of mobility in both shoulders as the result of a rotator cuff infection, tears, and surgery. While she consulted with a number of physicians, it wasn’t until she saw the experts at Excellent Physical Therapy that she finally experienced the relief and improvement she’d longed for. “After helping me to regain movement in my shoulder, the team at Excellent Physical Therapy suspected disc problems as well and recommended that I see a spine specialist, who found that I had two bulging discs in my neck that were contributing to my shoulder issues; since then, the therapists at EPT have helped me to decrease my neck pain significantly,” Dawson said. Within her knee, “the EPT team manipulated scar and soft tissue that hadn’t healed properly and truly took the time to do that work such that by the time they finished, my knee was better than it had been in 10 years.” Dawson also vigilantly adhered to an EPT-prescribed regimen of exercises designed to strengthen the muscles around her injuries. “Debbie is highly motivated, extremely diligent, and works her tail off in her rehab program and has had great results,” said EPT physical therapist Frank Lamorte of Dawson’s success. However, he credits his time at Excellent Physical Therapy with getting him on the road to sustained recovery. 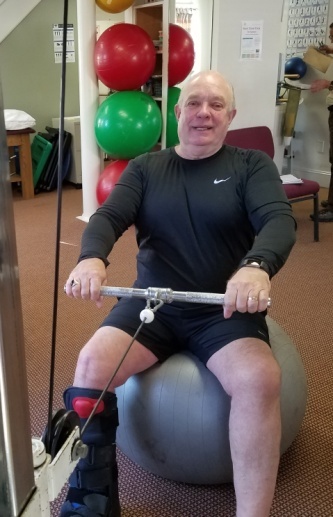 “I started rehabbing at Excellent Physical Therapy 20 years ago,” said the upbeat Pittman, who regularly sees the specialists there and vigilantly works out at EPT’s facility on Somerville Road for 60-75 minutes three days a week. “It’s not simply the facility or the skill of the providers that make the difference, but the energy, heart, and attitude that they bring to their treatment and patient relationships,” he said of the success he’s experienced under their care. “The facility is a positive, friendly environment and I consider the entire staff trusted friends as well as seasoned practitioners. They have a great ability to take an individual approach to each patient and to do it with a sense of energy, enthusiasm, care, and skill that permeates the practice. As a result,” Pittman concluded, “I’m happy to say that I’m in some of the best shape of my life.